SRINAGAR, Dec 30: Militants today took away four rifles from the residence of former Member Legislative Council (MLC) in Jawahar Nagar area of Srinagar and this is the second incident of weapon looting in the same area this year. A senior police officer said that one of the PSO’s of the former Legislator Muzaffar Ahmad Parray reported to Police Station Rajbagh that three militants barged into J-37 Govt Quarters Jawahar Nagar and took four assault rifles and his cell phone at around 1:30 p.m today. The PSO said that he was the only security guard on duty at the time of the incident while three others had gone home. All the four policemen, three from security wing and another from District Police Sopore attached with the former Legislator, have been summoned for questioned. Police has registered the case and started investigation. Sources said that Parray is out of Kashmir for last one month and neither he nor his PSOs had reported to the security wing of police or Sopore Police about the movement of the protected person. A senior police officer said that the security wing of the police have already issued advisory to the protected persons and their PSOs that they should report to SSP Security or District SPs about their movements. But both Parray and his security guards ignored it. In September this year, an SPO hailing from Zainapora, Shopian, stole seven AK rifles and a pistol from the residence of a PDP leader, Aijaz Ahmad Mir, in the same locality. The SPO, Adil Bashir Sheikh, had later appeared in a picture along with a group of militants. The looted weapons were also displayed in the photograph. Meanwhile, an alert has been sounded across the Srinagar district and the routes leading to South Kashmir. Security forces also launched searches at multiple places in Srinagar and its outskirts. Militants this evening attacked a patrolling party of the police in South Kashmir’s Pulwama town. A police official said that militants fired at a joint patrol of the police and the CRPF in Pulwama town around 5 pm. He said that there were no reports of any injury or loss of life. Militants, immediately after the attack, fled from the spot. 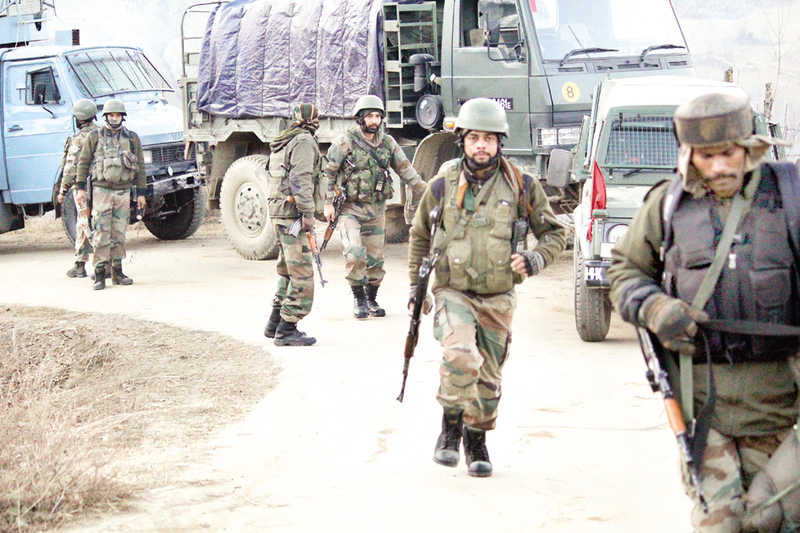 A heavy deployment of police and CRPF personnel was made at multiple locations in the town to thwart any possible protests against killings of four militants in Hanjin Payeen village when the incident took place. And in Dandmuh village of Chadoosa area in Baramulla, militants this evening fired at an Army patrol and fled. The security forces immediately cordoned off the area and conducted searches.